. . . . . Denotes a new section. . . . . . . . . Denotes the beginning of changed text within a section. . . . . . . . . Denotes the end of changed text within a section. All personnel who perform work on or near equipment in which the unexpected energization or start-up of the equipment, or the release of stored energy, could cause injury shall personally lock out the equipment for the duration of their work. Lockout/Tagout (LOTO) is required whenever construction, service, maintenance, modification, or demolition is being performed on or near equipment in which the unexpected energization or start-up of the equipment, or the release of stored energy, could cause injury to people. Documented procedures are followed, and special equipment is used which will provide proven effective protection for employees. Energized testing and troubleshooting (e.g., alignment, measuring, calibration, faultfinding) does not require LOTO where the equipment must be energized to perform the tests. Work on cord-and-plug-connected electrical equipment does not require LOTO controls when Work Process C is followed. Control of hazardous ionizing radiation is covered under the ES&H Manual Radiation Protection Program.Work in radiation areas covered by credited control radiation safety systems does not require LOTO controls when Work Process R is followed. This program is required for all Berkeley Lab employees, affiliates, students, visitors, and subcontractors who may be exposed to hazardous energy while performing any construction, service, maintenance, modification, or demolition activity. Persons performing work on projects or sites that do not fall under DOE jurisdiction are not required to follow the requirements of this LOTO Program. However, an equivalent LOTO program meeting applicable regulatory requirements will apply. Any lock used for a purpose other than LOTO. The lock may serve a safety function other than LOTO, a configuration-control function, or other purpose. Can be any color except red. A condition where a mechanical device is inserted into the energy path to physically prevent movement. Most commonly used with moving parts. Any LOTO that does not meet the requirements for a simple LOTO is called a complex LOTO. Requires an assigned Person In Charge and a LOTO procedure. Specific definitions and requirements for radiation-generating devices, radiation safety systems and credited controls are found in the ES&H Manual Radiation Safety program; EH&S Procedure 730, Radiation Generating Device Program; and EH&S Procedure 731, RGD Interlock Program. Energy isolations shall be capable of being locked out. Push buttons, selector switches, software interlocks, and control circuit type devices are not energy isolations and cannot be used to isolate hazardous energy. Exclusive Control Under the exclusive control of the employee means that the authorized person has the authority to, and is continuously in a position to, prevent (exclude) other individuals from re-energizing or starting the machine or equipment while performing the servicing or maintenance activity. A LOTO lock used for the purpose of group LOTO. It is identified by a group LOTO lock tag. The keys to group LOTO locks are controlled in a LOTO lockbox. A condition where a source of hazardous energy has been controlled by physically stopping the energy path so that the energy cannot flow to workers or equipment. The term “isolated” is commonly used with electrical circuits and fluid lines. The LOTO Approver is a person designated by the division to approve LOTO procedures. LOTO Approvers must be authorized as a LOTO Responsible Individual and have technical competence and familiarity with the equipment or systems for which the LOTO procedure is written. They must obtain additional technical assistance as required from qualified persons who are more familiar with the systems involved. A person who has completed the required LOTO training (general and procedure-specific) and is authorized by the supervisor or work lead to perform LOTO on energy isolation points to perform service or maintenance. Only LOTO Authorized Persons shall apply locks and tags to control hazardous energy. The LOTO Responsible Individual (RI) is a Person In Charge of a LOTO who has been trained to properly execute and manage LOTO procedures of a more complex nature than those allowed by a LOTO Authorized Person. A LOTO lock applied by the LOTO responsible individual (RI) for the purpose of controlling a complex or group LOTO. It is identified by an RI LOTO lock tag. The keys to LOTO RI locks are controlled by the RI. LOTO RI locks also function as personal LOTO locks for the RI. A distinctive, durable tag approved by Berkeley Lab to identify a lockout device and the purpose of the lock. The LOTO tag is attached to the LOTO lock shackle. A LOTO lock issued to a LOTO Authorized Person for the purpose of individual control. No other person has the key or means of opening it. A person who, by reason of experience and instruction, has demonstrated familiarity with the construction, installation, maintenance, and operation of the equipment, installations, and the hazards involved, has been designated by the supervisor or work lead to perform work on equipment. This employee also is required to be current with all required qualification training. A qualified person specifically authorized to work on electrical systems. For specific requirements, see the ES&H Manual Electrical Safety program. A condition whereby the equipment has been placed in a zero-energy state and controlled to prevent re-energization through the process of lockout. Equipment is not safe to work on until it is in a safe work condition. Workplace activities such as constructing, installing, setting up, adjusting, inspecting, modifying, maintaining, and/or servicing machines or equipment. These activities include lubricating, cleaning, or unjamming machines or equipment; and making adjustments or tool changes where the employee may be exposed to the unexpected energization or start-up of the equipment or release of hazardous energy. Any device capable of holding hazardous energy after equipment shutdown. This includes, but is not limited to, capacitors, tanks, pipes, springs, and flywheels. The subcontractor LOTO permit is a LOTO procedure designed for subcontractors. It incorporates the standard Berkeley Lab LOTO procedure format with a process to verify that subcontractors have received the appropriate training and supervision prior to participating in a LOTO. The placement of a LOTO tag directly on an energy isolation because the energy isolation cannot accommodate a LOTO lock. Trapped key interlock system An access control system where a key is held captive until a certain condition is satisfied. When the key is released, it is carried to unlock another enclosure or set of keys. The key is again held captive in the new enclosure while the enclosure is unlocked. A condition reached when all hazardous energy sources to or within equipment are isolated, dissipated with no possibility of re-accumulation, and verified as absent through proper testing. A process to verify a zero energy state. For electrical energy, this is called Zero Voltage Verification (ZVV). The following is a reference guide to the rest of this document. Its intent is to guide the reader to the appropriate work processes with a brief overview. Detailed requirements are found in the referenced sections. An introduction to the core rules of LOTO is found in Work Process B, Basic LOTO Rules. Cord-and-plug equipment is exempt from LOTO and may be controlled by anyone who has received basic electrical safety training. See Work Process C, Cord-and-Plug Equipment. The following work processes are commonly associated with energy control but are not integral to the LOTO process. They describe how to properly integrate these work practices with the LOTO Program. Lockout/Tagout (LOTO) is the process of establishing a safe work condition on equipment prior to performing work. A safe work condition is when the equipment has been placed in a verified zero-energy state and positively controlled to prevent unexpected re-energization. Lockout/Tagout (LOTO) is required whenever construction, service, maintenance, modification, or demolition is being performed on or near equipment in which the unexpected energization or start-up of the equipment, or the release of stored energy, could cause injury to people or damage to equipment. This includes access to areas where it would be unsafe unless the equipment were shut down and de-energized. All persons performing work on locked out equipment shall apply their personal LOTO lock(s) to that equipment. These persons shall be trained and authorized as LOTO Authorized Persons in accordance with Work Process M .
LOTO Authorized Persons shall only apply their own personal LOTO lock. No person shall ever remove another person’s personal LOTO lock, except under the restrictions of Work Process O , Special Condition LOTO Lock Removal. Note: The system operator control method found in OSHA 1910.269(d)(8)(v) is not applicable or permitted at Berkeley Lab. No person shall operate or attempt to operate any energy isolation to which a LOTO lock or tag is attached other than during the initial challenge when establishing the LOTO. Upon initially applying the LOTO device, the isolation is challenged to ensure that it will not operate. After this initial challenge, other persons MUST NOT challenge the LOTO device unless all LOTO locks have been removed. This is to prevent the unintentional energization when the LOTO device is improperly applied. If any person should suspect that a LOTO device has been improperly applied, they must immediately contact the Person In Charge for resolution. If necessary, the Person In Charge must stop work and have all LOTO Authorized Persons remove their personal locks in order to correct the discrepancy. The LOTO Safe Zone is the extent of equipment that has been placed in a safe work condition. It is defined by the energy isolations that were selected for the LOTO. The LOTO Safe Zone must always encompass the entirety of the expected scope of work. If the scope of work is expected to shift outside of the LOTO Safe Zone, then the work must be stopped and the LOTO must be changed in order to accommodate the new scope of work. All lockouts shall be established following the requirements in this program. Push buttons, selector switches, software interlocks, and control circuits are not energy isolations and cannot be used to isolate hazardous energy. The Person In Charge of a LOTO procedure must ensure that the LOTO Safe Zone always matches the scope of work at any given time. Only LOTO Authorized Persons and Qualified Persons may perform the necessary manipulation and testing required to establish the lockout. This includes equipment shutdown, operation of isolation devices, releasing stored energy, and verification of de-energization. When work is finished, this requirement also includes restoration, re-energization, and start-up of the equipment. Cord-and-plug equipment refers to any electrical utilization equipment that uses a flexible cord and an attachment plug to connect to a source of hazardous energy. Persons working under the cord-and-plug exemption are not required to be LOTO Authorized Persons. However, persons that perform work on electrical equipment under the cord-and-plug exemption may need to be Qualified Electrical Workers. See the ES&H Manual Electrical Safety program for more information. Note that hard-wired electrical utilization equipment shall not be converted to cord-and-plug connection unless it meets the requirements and intent of NFPA 70 – National Electrical Code (NEC) Sections Article 400.7 and 400.8 and NRTL and manufacturer instructions. The plug(s) remain(s) under the exclusive control of the worker performing the work. Under the exclusive control of the worker means that the authorized person has the authority to, and is continuously in a position to, prevent (exclude) other individuals from re-energizing or starting the machine or equipment while performing the servicing or maintenance activity. For cord-and-plug equipment that does not meet the exemption requirements, the LOTO process shall be applied. If there is stored energy above hazardous thresholds listed in Table 2.2.13 of the LBNL Electrical Safety Manual, such as capacitors 100 V or greater and 10 Joules or greater, a Complex LOTO Procedure must be used. If exclusive control cannot be established and there is a single plug and no stored energy, a Simple LOTO may be used. If, however, there are multiple cords, a Complex LOTO Procedure must be used. A benchtop instrument with a 120 VAC, 15 Amp cord. It has no stored energy, and unplugging the cord completely removes all hazardous energy from the device. A welder with a 480 VAC, 100 Amp cord. It has no stored energy, and unplugging the cord completely removes all hazardous energy from the device. A bandsaw with a 120 VAC, 15 Amp cord. It has no stored energy, and unplugging the cord completely removes all hazardous energy from the device. A vacuum chamber where exclusive control can be established for all cables connected to it, and there is no possibility of coming into contact with any stored energy. Rack-mounted instrument with a 120 VAC, 15 Amp cord. The cord plugs into a power strip located in the back of the unit and is not accessible from the front. The worker needs to perform a task on the front of the panel and cannot see or control where the plug is located. A simple LOTO is required because exclusive control cannot be established. A benchtop laser with 120 VAC, 15 Amp cord and an internal capacitor bank with 25 J of stored energy. A complex LOTO procedure is required because of the hazardous stored energy. Equipment that has multiple cords where exclusive control cannot be maintained. In this case, LOTO would be considered complex and require a LOTO procedure. The simple LOTO process is a LOTO that does not require a LOTO procedure. This process may be used by a LOTO Authorized Person to establish a safe work condition prior to performing work. The LOTO Authorized Person is responsible for determining whether the conditions for the simple LOTO process are satisfied. If these conditions are not satisfied, then the LOTO Authorized Person shall follow the complex LOTO process. The machine or equipment has no potential for stored or residual energy or reaccumulation of stored energy after shut down which could endanger employees. The machine or equipment has a single energy source which can be readily identified and isolated. The isolation and locking out of that energy source will completely deenergize and deactivate the machine or equipment. The machine or equipment is isolated from that energy source and locked out during servicing or maintenance. A single lockout device will achieve a locked-out condition. The lockout device is under the exclusive control of the authorized employee performing the servicing or maintenance. In utilizing this exception, there have been no accidents involving the unexpected activation or reenergization of the machine or equipment during servicing or maintenance. The simple LOTO process does not require a written LOTO procedure. Instead, the LOTO Authorized Person is responsible for determining what should be isolated and how to establish the LOTO. The LOTO Authorized Person must therefore be intimately familiar with the steps described in this process. Appendix A is available as a short-form memory aid to assist the LOTO Authorized Person in properly executing the LOTO. In order to execute the simple LOTO process, the LOTO Authorized Person shall also be a Qualified Person on the system. If a LOTO Authorized Person requires a simple LOTO but is not a Qualified Person on the system, the LOTO Authorized Person may request assistance from a properly LOTO Authorized and Qualified Person. After the Qualified Person establishes a safe work condition, the LOTO Authorized Person shall then apply their personal LOTO lock. This process does not require a complex LOTO or LOTO procedure. Only Qualified Electrical Workers, as designated in the ES&H Manual Electrical Safety program, may perform LOTO on electrical equipment for the purpose of working on electrical circuits. For other forms of hazardous energy, this qualification depends on line-management authorization. Step 1 — Identify energy source and related hazards/controls. Assess the type, magnitude, and hazards of the energy to be controlled. If there is more than one energy source, or if there is a source of stored energy, then the simple LOTO method may not be used. Follow the complex LOTO method instead. Determine the appropriate method for controlling the source of hazardous energy. Methods for energy isolation may include such things as circuit breakers, disconnect switches, or valves. Remember that control circuits such as push buttons, selector switches, emergency stops, contactors, and remotely operated valves are not energy isolations. Determine the appropriate safe work practices for performing the isolation and verification of zero-energy state. Only a Qualified Person wearing proper PPE may operate the isolation and perform verification of zero-energy state. Step 2 — Notify affected persons. Notify all Affected Persons of the impending shutdown and lockout. These persons must be informed that they are not to disturb the lockout device or attempt to restart the equipment until they are informed that the lockout has been cleared and it is safe to resume normal operations. Step 3 — Shut down equipment. Verify that it is safe to shut down equipment, then perform normal equipment shutdown. Turn off or shut down the equipment using the established method for that equipment. Step 4 — Isolate energy source. Identify the correct energy-isolation device before operation. Take steps to ensure that the means used (disconnect, valve, etc.) for energy isolation correctly corresponds to the equipment on which LOTO is being performed. Check the isolation label and match it to the label on the equipment. Take special care with look-alike equipment. Isolate the energy source by operating the energy isolation (switch off, valve off, etc.). Step 5 — Apply LOTO lock and tag. Equipment design may require performing the verification in Step 6 prior to the application of lock and tag. Apply the required LOTO device to the energy isolation in such a way that it physically prohibits operation of the energy isolation. Use a LOTO hasp if multiple LOTO Authorized Persons will perform work. Apply the Personal LOTO lock and tag to the LOTO device. Write name, phone number, and any other relevant information on the LOTO tag. Step 6 — Verify proper isolation. DO NOT ATTEMPT TO OPERATE THE ENERGY ISOLATION IF ANY OTHER LOTO LOCK IS ALREADY APPLIED. DOING SO COULD RESULT IN INADVERTENT ENERGIZATION OF THE SYSTEM AND EXPOSE PERSONNEL TO HAZARDOUS ENERGY. EVERY TIME: Challenge your personal LOTO lock to ensure that the lock is fully latched. ONLY IF YOU ARE APPLYING THE FIRST LOTO LOCK: Challenge the LOTO device to ensure that it cannot be removed from the isolation. ONLY IF YOU ARE APPLYING THE FIRST LOTO LOCK: Challenge the energy isolation to ensure it will not operate. Attempt to restart the equipment using the normal equipment controls. Verify the equipment will not power up or start. Test the energy source using appropriately rated instruments. Any instrument used to test for voltage, pressure, or temperature shall be checked for proper operation both before and after use on a known live source. The test point must be directly connected to the energy isolation. There cannot be other system components (such as check valves, contactors, other in-line switches or fuses) between the test point and the isolation, as these may mask the presence of energy on a deficient isolation. All energy is to be treated as present until positively proven otherwise. This means that applicable safe work practices and required PPE shall be used to perform the test for zero-energy state. The lockout shall remain in place for the duration of work. Other LOTO Authorized Persons may join the LOTO by applying their personal LOTO lock and tag. The LOTO Authorized Persons must remain vigilant and ensure that the scope of work does not extend out of the LOTO Safe Zone. If the persons performing work identify a task that falls out of the LOTO Safe Zone, then work will be stopped and a decision will be made either to modify the LOTO or to forego the work until the LOTO can be modified. Confirm that the work for which the LOTO was applied has been completed and that it is safe to re-energize equipment. Clear all tools and personnel. Check the work area to ensure that all tools, debris, and personnel are at a safe distance from the equipment. Replace safety guards. Check the equipment to ensure that any removed guards are reinstalled. Confirm that all employees are in a safe position. Ensure all persons remain clear of the equipment’s point of operation or hazard zone. Remove all personal LOTO lock(s) and tag(s) from the isolation. Each personal LOTO lock shall only be removed by the LOTO Authorized Person who applied it. Exception: If the person who placed the lock and tag is not available, the procedure for Absent Person removal of LOTO devices shall be followed (Work Process O). Step 3 — Notify all Affected Persons that the LOTO has been released and equipment will be re-energized. Step 4 — Re-energize and restore the equipment to the normal condition. Equipment that will be placed out-of-service for an extended period of time may be controlled using an administrative lock (Work Process S) instead of a LOTO lock when no work is being performed. Alternatively, a Simple LOTO may remain in place while work is not being performed when the equipment is not safe to be reenergized. The complex LOTO process is triggered anytime the conditions for the simple LOTO (Work Process D) cannot be met. It requires an approved written LOTO procedure and a designated Person In Charge who is accountable for the safe execution of the LOTO. For complex LOTOs involving group LOTO (lockbox), Tagout Only, multiple employers, temporary partial restoration, or shift changes, Work Process F, Complex LOTO Requiring a Responsible Individual, must be followed. Every complex LOTO shall have an approved written LOTO procedure that meets the requirements of Work Process N.
The LOTO procedure is a formal written document, approved by a LOTO Approver, which details the scope of work performed under the LOTO and the energy isolations to be established. The LOTO procedure also details, where required, the method of stored energy dissipation and any specific sequence required for the shutdown. For non-routine LOTO procedures, procedures should be printed out and posted at the jobsite or otherwise made available for LOTO Authorized Persons to reference. Routine LOTO procedures are equipment specific LOTO procedures that are performed over and over without change. When used, Routine LOTO procedures must be posted at the equipment. The purpose of posting a routine LOTO procedure is so that it does not have to be reprinted for each use. Check to make sure the scope of work matches the procedure and then complete the LOTO log associated with that procedure. These documents should be kept within your division for auditing purposes. In order to execute a complex LOTO, the LOTO Authorized Person should also be a properly Qualified Person on the equipment. If a LOTO Authorized Person requires a complex LOTO but is not a Qualified Person on the system, the LOTO Authorized Person must request assistance from a properly LOTO Authorized and Qualified Person. After the Qualified Person establishes a safe work condition, the LOTO Authorized Person shall then apply their personal LOTO locks. Only Qualified Electrical Workers, as designated in the ES&H Manual Electrical Safety program, may perform LOTO for the purpose of working on electrical equipment. Print out and review the LOTO procedure. Verify that the scope of work to be performed is described in the LOTO procedure, and that the LOTO Safe Zone is adequate for all planned work. If the LOTO procedure requires revision or is otherwise inadequate, STOP WORK and contact the equipment owner to obtain the proper LOTO procedure. Determine whether you are a Qualified Person who has been trained to perform the isolations and zero-energy verifications described in the LOTO procedure. If not, contact a Qualified Person and have him or her assist you in executing the LOTO procedure. Notify all Affected Persons of the impending shutdown and lockout. Affected Persons must be informed that they are not to disturb the lockout devices or attempt to start up the equipment until they are informed that the LOTO has been cleared and it is safe to resume normal operations. Shut down the equipment. Some LOTO procedures will have a required sequence to properly shut down the equipment. This will be attached to the isolation checklist and must be followed exactly as described. Some isolations may also require stored energy dissipation. The exact method of dissipation will be described in the LOTO procedure. Sign off the LOTO procedure to indicate that the LOTO procedure has been established. Post the completed LOTO procedure next to the work area. The lockout shall remain in place until work on the equipment is complete. Other LOTO Authorized Persons may join the LOTO after obtaining clearance from the Person In Charge. The LOTO Authorized Persons shall then apply their personal LOTO locks and tags to each of the energy isolations listed in the LOTO procedure. The Person In Charge of the LOTO must remain vigilant and ensure that the scope of work does not extend beyond the LOTO Safe Zone. If the persons performing work identify a task that falls out of the LOTO Safe Zone, then work will be stopped and a decision will be made either to submit a new LOTO procedure for approval or to forego the work until the LOTO can be modified. If it is necessary to temporarily remove only one or some LOTO devices before work is complete, such as for testing or repositioning equipment, a Responsible Individual must be assigned according to Work Process F before following Work Process K, Temporary Partial Restoration. Step 1 — Confirm That It Is Safe to Re-energize. Step 5 — Sign off the LOTO procedure to indicate that the complex LOTO has been cleared. Place the completed LOTO procedure in a location for safekeeping. The Responsible Individual (RI) is a Person In Charge of a LOTO who has been trained to properly execute and manage LOTO procedures of a more complex nature than those allowed under Work Process E.
An RI LOTO lock is a LOTO lock applied by the RI of a particular lockout. It is identified by the RI LOTO tag attached to the LOTO lock. The RI LOTO locks enable the RI to maintain positive control of the isolations. RI LOTO locks allow the RI to witness the verification of zero-energy state without passing on that requirement to subcontractors. RI LOTO locks also function as personal LOTO locks for the RI. A formal LOTO briefing is the process of verbally communicating the detailed specifics of the LOTO to all LOTO participants. This includes the Qualified Persons supporting the LOTO and the LOTO Authorized Persons who will be adding their personal LOTO locks once the LOTO is established. The LOTO briefing is always conducted in person by the Responsible Individual assigned to the LOTO procedure. The LOTO briefing is a critical part of the LOTO process. All LOTO Authorized Persons must obtain a LOTO briefing from the Responsible Individual prior to applying personal LOTO locks. The briefing performed just before establishing the LOTO. This briefing typically focuses on the Qualified Persons supporting the LOTO. The briefing performed after the LOTO is established but before the LOTO Authorized Persons apply their personal LOTO locks. This briefing typically focuses on the LOTO Authorized Persons. The LOTO briefing is repeated at the beginning of each shift for any LOTO Authorized Person that needs to apply their Personal LOTO Locks. The LOTO briefing is performed before and after temporary partial restoration (Work Process K). The Responsible Individual must identify conditions where additional measures may be required to ensure the safety of all persons involved in the LOTO. These conditions include situations where the LOTO Safe Zone is difficult to readily identify, or where multiple changes in scope result in transitions from one LOTO permit to the next. Additional measures may include added supervision, special temporary marking of equipment, or additional LOTO briefings. Print out and review the LOTO procedure. Verify that the scope of work to be performed is reflected on the procedure, and that the LOTO Safe Zone is adequate for all planned work. If the LOTO procedure requires revision or is otherwise inadequate, contact the equipment owner to obtain the proper LOTO procedure. Using the LOTO procedure, follow all of the steps in the complex LOTO work process. For each isolation, the Responsible Individual must place an RI lock as the first lock. The Responsible Individual must brief all the LOTO Authorized Persons before they apply personal locks to the isolations. When the work has been completed and after each LOTO Authorized Person has removed his/her respective personal LOTO locks from the isolations, the Responsible Individual removes the RI Lock from the isolations, and returns the equipment to service. A group LOTO is a process used to perform a complex LOTO with a lockbox. Instead of applying personal LOTO locks to each energy isolation, the energy isolations are locked out with group LOTO locks. The keys to the group LOTO locks are placed in the lockbox, which is then locked by the Responsible Individual (RI) and each LOTO Authorized Person. The RI may elect to use the Group LOTO process at any time to better facilitate the coordination of a LOTO. Group LOTO is required when performing Tagout Only (Work Process H). Otherwise, group LOTO is not required but may present a desirable solution to effectively manage a large number of persons or isolations. A group LOTO lock is a LOTO lock used specifically for group LOTO. It is identified by the group LOTO tag attached to the LOTO lock. A group LOTO lock is applied by the RI to each energy isolation during the execution of a group LOTO procedure. The keys to the group LOTO locks are then placed in a lockbox, which is then locked with an RI lock. Group LOTO locks are mandatory for the group LOTO method. The RI determines that the group LOTO work process is appropriate. The RI executes the written LOTO procedure as described in Work Process F.
Instead of RI Locks, the RI must apply group LOTO locks to the hasps on the energy isolations. The RI shall place the group LOTO lock keys inside a lockbox. The RI must lock the lockbox closed with an RI lock and tag on the outside of the lockbox. The RI must attach the completed LOTO procedure to the lockbox. The RI must brief all LOTO Authorized Persons before they apply personal locks to the lockbox. All other workers performing work on the equipment satisfy themselves that the group LOTO procedure has been completed, and then apply their personal LOTO lock and tag to the lockbox in a manner that prevents access to the enclosed key(s) until all locks have been removed from the box. When the work has been completed, and after each worker has removed his/her respective personal LOTO lock from the lockbox, the RI removes their RI lock from the outside of the lockbox, obtains the group LOTO lock keys from the lockbox, removes the group LOTO locks, and returns the equipment to service. There are times where the RI must take additional measures to accommodate a LOTO Authorized Person who has concerns about a group LOTO or who is not fully satisfied with the group LOTO method. The RI shall make necessary arrangements to accommodate such requests. Any LOTO Authorized Person may request to either witness the verification or reverification of zero-energy state on some or all of the energy isolations. In this case, the RI must coordinate with a Qualified Person to perform the requested verifications. Any LOTO Authorized Person may request to not participate in the group LOTO and instead apply personal LOTO locks directly to the isolations, next to the group LOTO locks. The LOTO must then be treated as a complex LOTO under Work Process F. Under the direction of the RI, who must be physically present, the LOTO Authorized Person must apply their personal LOTO locks to each energy isolation listed on the LOTO procedure without exception. Once established, the LOTO lockbox must be kept in a location that is accessible to the LOTO Authorized Persons participating in the group LOTO. One or more lockboxes can be referenced under a master complex LOTO procedure or another group LOTO procedure. This is useful when managing lockouts with extensive scope and complexity. There must be only one group LOTO procedure per lockbox. If it is necessary to group multiple LOTO procedures under one master lockbox, each procedure must first be built into its own separate group LOTO. When pyramiding lockboxes, each lockbox must have its own LOTO procedure attached to the lockbox. The master lockbox LOTO procedure must reference each subordinate lockbox by a separate line item on the isolation checklist. “Tagout only” is the practice of applying a LOTO tag without a LOTO lock, where the physical construction of the energy isolation does not accommodate the attachment of a lock. Extra caution shall be exercised when using a Tagout Only procedure. Tags may evoke a false sense of security. Tags are warning devices and do not provide the physical restraint provided by a lock. A justifiable and verifiable need must be identified. Formal approval must be obtained from the immediate supervisor or other line management. Any energy isolation capable of being locked shall be locked WITHOUT EXCEPTION. When work is required inside the enclosure, opening the enclosure disconnects the actuating handle from the breaker. This defeats the application of a LOTO lock on the handle, and there is usually no physical means to apply a lock inside the enclosure, directly to the breaker. In this case, a tagout must be applied to the breaker inside the enclosure. Additional measures can include removing the actuator-connecting bar or also tagging out the handle on the door. The concern is that, should the door be closed, the handle could be operated, closing the breaker. Performing a Tagout Only procedure requires a secondary measure. At Berkeley Lab, the secondary measure consists of utilizing a serialized LOTO tag, where a detachable stub has a matching serial number. The detachable stub is placed in a lockbox, and the Tagout Only procedure is performed like the group LOTO method. Tagout must only be conducted under group LOTO (Work Process G). Directly affix to the isolating device a serialized tagout tag with a detachable stub instead of a group LOTO lock. The tag attachment means shall be capable of withstanding at least 50 pounds of force exerted at a right angle to the disconnecting means’ surface. The tag attachment means shall be nonreusable, attachable by hand, self-locking, and nonreleasable, equal to an all-environment-tolerant nylon cable tie. Tear off the tagout tag stub and place it in the lockbox. Write the tag serial number onto the group LOTO procedure. Complete the group LOTO procedure. Once the procedure is completed, the RI locks the box with the RI lock. All persons performing work under the tagout will then apply their personal LOTO locks to the lockbox. The subcontractor LOTO permit is a Complex LOTO procedure designed for subcontractors. It incorporates the standard Berkeley Lab LOTO procedure format with a process to verify that subcontractors have received the appropriate training and supervision prior to participating in a LOTO. All subcontractors performing work for Berkeley Lab are required to conform to the Berkeley Lab LOTO Program. This Work Process I contains additional requirements to ensure that subcontractors are adequately managed and protected from hazardous energy exposures. The subcontractor LOTO permit process is in place to implement these requirements. Subcontractors include all construction and non-construction subcontractors, all vendors, and all manufacturer representatives or other persons performing or participating in LOTO who are not covered under the Berkeley Lab employee Work Planning and Control program and are therefore not subject to employee LOTO training and authorization requirements. All subcontractor LOTO permits require a designated LOTO Responsible Individual (RI) and are implemented by following Work Process F, Complex LOTO Requiring a Responsible Individual. The Subcontractor LOTO permit may waive the requirement for RI locks on a case-by-case basis. The LOTO RI submits Subcontractor LOTO permit requests to the LOTO Permit Database. The requests are reviewed and approved by the designated LOTO Approver who is responsible for the area involved. Prior to participating in any LOTO, subcontractors must have an approved and printed subcontractor LOTO permit and must be briefed by the designated LOTO RI. Subcontractors who require a LOTO permit shall first submit their company LOTO program or equivalent company policy document to the EHS Electrical Safety Group. This document is required to make sure LBNL understands the Subcontractors LOTO program. If the subcontractor company does not have a program, that will be documented. In addition, the subcontractor company must submit a signed statement on company letterhead certifying that all their employees have been trained as LOTO Authorized Persons in the context of OSHA 1910.147(c)(7). A template for this form can be found on the LBNL Electrical Safety website. All subcontractors shall additionally receive a subcontractor LOTO orientation that covers the specific process requirements used at Berkeley Lab (Work Process M). Subcontractors/vendors are expected to provide their own LOTO equipment. Berkeley Lab may loan LOTO hardware as needed to meet urgent operational necessities. All subcontractor LOTO hardware must meet the requirements set in Work Process L.
Only Subcontractor Qualified Electrical Workers (QEWs) who have been separately and individually approved under the Electrical Safety Program may perform their own zero voltage verification (ZVV) on electrical lockouts. See the ES&H Manual Electrical Safety program for more information. All conditions for Simple LOTO in Work Process D are met. The equipment is labeled with a current arc flash label. Approval is obtained from the Construction Manager and the appropriate Facilities Manager. Note: this is normally restricted to new building construction projects and is specified in the project’s Electrical Energization Plan. Cord-and-plug equipment is exempt from LOTO provided it meets the requirements of Work Process C.
Where exclusive control of the plug cannot be achieved and there is no stored energy, a Simple LOTO may be used without a Subcontractor LOTO Permit, but the Subcontractor employee will need to complete the course EHS0379, Subcontractor Lockout/Tagout online. If requirements of Work Process C cannot be met and the LOTO is Complex, then a Subcontractor LOTO Permit must be obtained. This Subcontractor LOTO Permit can act as your LOTO procedure for the equipment as long as the scope of work stays consistent. The RI must ensure that all requirements of Work Process F are followed when implementing the LOTO permit. Upon completion of the LOTO, the Responsible Individual must return the completed LOTO permit to the EHS Division Electrical Safety Group. The EHS Division Electrical Safety Group must review the contractor safety plan and ensure that it provides a level of LOTO safety equivalent to this ES&H Manual program and 29 CFR 1910.147(c)–(f). A field change is a pen and ink markup of a LOTO Permit that corrects an error discovered during the execution of the LOTO. Field changes to LOTO Permits may be allowed with certain restrictions. Change in Scope of Work: Scope change after permit approval. This is only allowed when the new scope of work is determined to be clearly within the LOTO safe zone. A field change record sheet must be completed for any field change. Authorization must be obtained verbally from a LOTO Coordinator and can be done over the phone. Only one field change is allowed per LOTO Permit. If a second field change is required, contact the EHS Electrical Safety Group for assistance in changing the permit. Only one change is allowed on a field change. One isolation can be added, or one isolation can be removed. If there is more than one isolation that needs to be added or removed. If there is time to modify the electronic version of the permit instead. If the change represents a significant departure from the original LOTO Safe Zone or scope of work. If there is the possibility of confusion about the permit. All field changes will be briefed by the RI. Shift changes and transfer of control present additional challenges and barriers to proper communication in a complex LOTO situation. It is imperative that the Responsible Individual (RI) makes every effort to sufficiently manage the scope of work and the extent of the LOTO Safe Zone. If equipment will remain locked out after the end of a shift, and work will continue by the oncoming shift, an orderly transfer of LOTO devices between LOTO Authorized Persons from the outgoing and incoming shifts must be performed. If the simple LOTO method was used, a shift change does not require transitioning to a complex LOTO with an assigned Responsible Individual . The RI for the LOTO must manage all shift changes. Transfer of control from one RI to another must occur separately from the shift change process to minimize confusion. It is recommended, but not required, that all LOTO Authorized Persons in the off-going shift remove their personal locks prior to going home at the end of the shift. The RI locks must stay in place to maintain continuity of the lockout. The lead worker or supervisor may also maintain a personal lock as desired. The RI must ensure that the oncoming shift is updated on the progress of work from the off-going shift. All changes in scope of work and the LOTO Safe Zone during the previous shift must be thoroughly explained to the oncoming shift. Note that an administrative lock alone is not sufficient to maintain the integrity of a LOTO. As the LOTO Authorized Persons from the off-going shift remove their personal LOTO locks, the RI must ensure that the RI locks remain in place. The off-going RI may transfer control of the LOTO to an oncoming RI at any time either before or after the LOTO is completely established. Transfer of control is not permitted while the LOTO is being established or during any modification, such as a field change or temporary restoration for testing or repositioning. The off-going RI must thoroughly brief the oncoming RI on the status of the LOTO, including all isolations, energy dissipation devices, scope of work, completion status of the work, and expected changes to the LOTO that will be required as the work progresses. The oncoming RI must inspect all isolations related to the LOTO and verify that the isolations are in place. At each energy isolation, the oncoming RI must apply his or her RI lock first, and then the off-going RI must remove his or her lock. When the oncoming RI is satisfied that he or she is fully briefed on all aspects of the LOTO, the oncoming RI must agree to assume the role of RI for the LOTO. The off-going RI must then hand over the LOTO procedure to the oncoming RI as part of the transfer. If transferring a group LOTO, the off-going RI must also transfer all related lockboxes and procedures. Once transferred, the oncoming RI assumes all responsibilities for the LOTO. As long as the RI locks remain in place on the isolations (or if in the case of a group LOTO, the group locks remain in place on the isolations, and the RI lock remains in place on the lockbox), then re-verification of zero-energy state is not required at the beginning of each shift or upon transfer of control. Should any of the RI locks be removed, re-verification of zero-energy state is required prior to allowing any LOTO Authorized Person to apply their personal LOTO lock. Temporary partial restoration is the process of restoring energy to a part of the system without clearing the entire LOTO. This is only done for a short period of time, under continuous supervision by an assigned Responsible Individual (RI). Perform a LOTO briefing with all LOTO Authorized Persons participating in the lockout. Direct all LOTO Authorized Persons to stop work, replace required guards or establish a barricade around the hazard zone, and clear the equipment of tools and materials. Direct all LOTO Authorized Persons to remove their personal LOTO locks from the isolations that will be temporarily energized. Remove all stored energy dissipating devices (grounding/shorting conductors, hooks, or wands). Energize and proceed with testing or repositioning. Once the testing or repositioning is complete, reestablish the LOTO, following all steps in Work Process F or Work Process G as required. Direct all LOTO Authorized Persons to reapply their personal LOTO locks to the isolations that were temporarily energized. LOTO locks are required to be RED. Conversely, any RED padlock is considered a LOTO lock. RED locks must not be used for any purpose other than LOTO. Administrative locks cannot be turned into LOTO Locks by painting or taping them red. LOTO locks are required to be keyed. Combination locks are not allowed at Berkeley Lab for the purpose of LOTO. LOTO locks must have only one key. There are to be no spare or emergency keys. LOTO locks may be keyed alike so long as responsibility for the locks is not shared: The locks are in use by only one person and the key to those locks are in the control of that person. If a set of locks is keyed alike for this purpose, only one key may be issued for that set of locks, and all spare keys must be destroyed. LOTO locks must be substantial enough to prevent removal without the use of excessive force or unusual techniques, such as the use of bolt cutters or other metal-cutting tools. Only LOTO tags may be used with LOTO locks. A LOTO tag must always be used in conjunction with a LOTO lock unless the energy isolation is not physically capable of being locked (see Work Process H). Since the tag indicates the purpose and ownership of the lock, the tag must be attached to the lock shackle, and never to the hasp or other LOTO device. All LOTO tags must be red, white, and black; state “Danger – Do Not Operate;” and must have a statement prohibiting unauthorized removal of the lock. LOTO tags, including their means of attachment, shall be substantial enough to prevent inadvertent or accidental removal. LOTO tag attachment means shall be of a nonreusable type, attachable by hand, self-locking, and non-releasable with a minimum unlocking strength of no less than 50 pounds and having the general design and basic characteristics of being at least equivalent to a one-piece, all-environment-tolerant nylon cable tie. LOTO tags must be of a material suitable for their environment. LOTO tags used outdoors must be resistant to weather and UV damage. Personal LOTO Tags: The LOTO Authorized Person performing LOTO must have his/her name and phone number on the tag. Subcontractors must also have his/her company name on the tag. This may be handwritten or permanently printed. Responsible Individual LOTO Tag: The RI LOTO tag must state “Responsible Individual Lock” or “RI Lock.” The RI must have his/her name and phone number on the tag. This may be handwritten or permanently printed. Group LOTO Tag: The Group LOTO tag must state “Group LOTO.” The RI must write his/her name and phone number on the tag, and the LOTO procedure or permit number if applicable. Tagout Only Tag: The Tagout Only tag must state “Tagged Out.” The RI must write his/her name and phone number on the tag, and the LOTO procedure or permit number if applicable. The Tagout Only tags are one-time use and are serialized with detachable stubs. The stubs are detached and placed into the lockbox. Lockboxes are standalone lockable boxes used for performing group LOTO. They come in a multitude of shapes and sizes to suit the needs of various users. Some are permanently mounted while others are portable. Lockboxes must be of sturdy construction and materials and be suitable for their intended environment. The lockbox must be constructed in such a way that permits multiple LOTO locks to be attached to the outside of the enclosure, preventing it from being opened except by removal of every last LOTO lock. The lockbox must be designed to securely contain the keys and not release them in the event of being shaken, dropped, or pried open. Many lockboxes come with a slot to insert keys after the box is already locked; however, this feature is not used at Berkeley Lab. Lockboxes must be fitted with a physical means to attach the completed LOTO procedure to the lockbox. This can be integral to the lockbox construction or retrofitted to the lockbox. This feature must be designed to display the front page of the LOTO procedure without folding or rolling, and must protect the LOTO procedure from damage from the elements. LOTO devices are mechanical attachments that affix to the energy isolation devices for the purpose of LOTO. They come in a multitude of shapes and sizes to match the wide variety of energy isolations found in the field. LOTO devices shall be substantial enough to prevent removal without the use of excessive force or unusual techniques, such as with the use of bolt cutters or other metal cutting tools. The most common LOTO device is the LOTO hasp. The LOTO hasp is either applied directly to an energy isolation capable of being locked out, or to another LOTO device. Since most LOTO devices only hold a limited number of LOTO locks, the LOTO hasp is used to add multiple locks. LOTO hasps may be attached to each other (i.e., daisy-chained) to accommodate as many locks as needed. Energy isolations come in multitudes of configurations, and commercially available LOTO devices are typically used to apply the LOTO lock and hasp combination. In some instances, however, no commercially available LOTO device can fulfill the function. It is acceptable to custom design and build a LOTO device that fits the application. Only persons who have received the appropriate level of LOTO training may be authorized to perform LOTO functions. Specific training requirements, including EHS courses, prerequisites, required retraining and authorizations, are listed in Table M-1. Once the LOTO training is complete, specific line management authorization is required to perform the LOTO functions. LOTO Authorized Persons shall fulfill the course requirements of EHS0370, Lockout/Tagout for Authorized Persons, to be repeated once every three years, unless they fall under one of the following exceptions. The person is only accessing an area requiring LOTO and is not performing work. A Responsible Individual is assigned to the LOTO and performs a LOTO briefing. The person applies a personal LOTO lock and tag under the direction of the Responsible Individual. The Responsible Individual personally escorts the person 100% of the time the person is in the area requiring LOTO. Each instance shall require prior approval of the Electrical Safety Program Manager and the Responsible Individual for the LOTO. The person shall be considered a LOTO Authorized Person for the specific instance. The person completes EHS0388, Limited Lockout/Tagout for Authorized Persons. The person completes EHS0389, Simple LOTO for Cord-and-Plug Equipment. Subcontractors will need to complete EHS0379, Subcontractor Lockout/Tagout Orientation. LOTO Responsible Individuals shall fulfill the course requirements of EHS0373, Lockout/Tagout for Responsible Individuals, to be repeated annually. Authorization to perform LOTO is covered by the ES&H Manual Work Planning and Control program. Specific authorization is to be provided by the supervisor after the employee satisfies the EHS course requirement and has received equipment-specific training. The supervisor must ensure that the employee is thoroughly familiar with the equipment (within the context of his or her job function) and with the energy-control procedures. A practical exercise may be required by the supervisor to demonstrate proficiency. The content of this exercise will depend on the types of hazardous energy control and the complexity of the procedure’s steps. Once the supervisor is satisfied that both the training and authorization requirements have been met, the supervisor may authorize an employee to perform LOTO. This authorization stipulates the specific equipment or types of equipment on which the LOTO Authorized Person may perform LOTO. Line Managers who supervise persons that are required to perform LOTO must fulfill the online course EHS0372, Lockout/Tagout Awareness for Line Management. Line Managers who are themselves LOTO Authorized Persons are not required to take EHS0372. All visiting scientists, engineers, affiliates, and students who work in areas in which LOTO is utilized are considered Affected Persons and must complete the LOTO awareness training module included in EHS0010, Overview of EH&S at LBNL. Visiting scientists or students who perform service, maintenance, or equipment modification are required to be trained as a LOTO Authorized Person. Obtain a subcontractor LOTO permit. The subcontractor LOTO permit constitutes authorization to perform LOTO. See Work Process I for requirements. LOTO Responsible Individuals do not have to repeat LOTO Authorized Person training. Prerequisites: Subcontractor company’s LOTO program submitted to and accepted by the EHS Electrical Safety Group. LOTO procedures can be developed by anyone familiar with the equipment. However, they must be reviewed and approved by a LOTO Approver with suitable competency in the equipment or systems for which the LOTO procedure is written. A LOTO Approver is a competent person who has been trained as a Responsible Individual and has been designated by the division to approve LOTO procedures based on his or her level of technical knowledge and familiarity with the systems involved. The LOTO Approver must obtain technical assistance as required from Qualified Persons who are more familiar with the systems involved. Each division with LOTO procedures must designate one or more LOTO Approvers to meet the LOTO needs of the division. Should a division not have the competency required, the EHS Division may provide assistance in reviewing and approving LOTO procedures. Developing a LOTO Procedure: The LOTO procedure writer must thoroughly investigate the scope of work and perform a detailed hazardous energy analysis in order to establish the appropriate isolations. After writing the LOTO procedure, it must be submitted for approval by an authorized LOTO Approver. Contact the lead worker in charge of the job. Have the lead worker describe in detail the scope of work, including all preparations and testing required. Walk down the job site to identify other hazards in the area that may need to be addressed. Ask detailed questions to determine whether other considerations are warranted. Perform a Hazardous Energy Analysis. The LOTO procedure writer must perform a hazardous energy analysis to identify the required isolations. Available documentation should be consulted, such as equipment drawings, schematics, manuals, panel schedules, and process and instrumentation diagrams (P&IDs). In addition, the system should be visually inspected to ensure all hazards are properly identified. Energy isolations shall be positive isolation devices such as a disconnect switch, circuit breaker, block valve, or blocking pin. Control actuators such as the emergency stop or the equipment controller shall not be used as lockout isolation points. Contactors, diodes, interlock switches, check valves, and automatically controlled valves are not positive isolation devices. Energy isolations shall be capable (or made capable) of accepting an approved lockout device that physically prevents the actuation of the energy-isolating device. Where the desired isolation consists of removing a spool piece, removing fuses, lifting electrical wires, or otherwise disconnecting an energy source without a lockable isolation, follow Work Process H , Tagout Only, for that isolation. Energy isolations must have an accessible test location to prove absence of energy. Interlocks, contactors, diodes, check valves, or automatically controlled devices must not be positioned between the isolation device and the test point used for verification of de-energization of the lockout point. Energy isolations must be labeled clearly and uniquely, such as with an alphanumeric designator or a word description of its function. In the case of stored mechanical energy, vent valves, spring releases, blocking devices, or equipment repositioning (as appropriate) must be utilized. In the case of stored electrical energy, approved grounding wands or discharge devices must be used. Stored energy that cannot be released must be locked out. If there is a possibility of re-accumulation of stored energy to a hazardous level, a method to continuously discharge the energy shall be installed and maintained for the duration of the lockout. For electrical systems >600 V, temporary personal protective grounds are required. Other examples include the double-block-and-bleed method for high-pressure fluids where slow leakage past an energy isolation valve can result in undetected repressurization of a section of piping. Unless specifically stated otherwise, LOTO steps in the LOTO procedure may be performed in parallel or in series. Either perform all steps in sequence for each isolation, completing all the steps for an isolation before moving to the next isolation; or, equivalently, perform each step for all the isolations before moving to the next step. Either way, use the LOTO procedure checklist to ensure that all steps are positively completed for each and every energy isolation. If a specific sequence is required for any part of the LOTO procedure, this sequence must be described in a written checklist. Alternative formats specific to divisions or user facilities may be used, provided that they contain the elements described in Appendix B . Only an authorized LOTO Approver may review and approve the LOTO procedure. The LOTO Approver will examine in detail every aspect of the LOTO, and become familiar with the scope of work and LOTO Safe Zone established by the LOTO procedure. Once the LOTO Approver has become satisfied that the LOTO Safe Zone adequately matches the scope of work, and all questions concerning the details of the LOTO are resolved, the LOTO Approver must approve the LOTO procedure. This approval may be in the form of a wet signature on a printed document or through an electronic database with electronic signatures. Grouping of LOTO procedures is not authorized, except for the purpose of periodic inspection in Work Process P. LOTO procedures must not describe multiple “scenarios” where energy isolations are selected based on different scopes of work. Instead, the LOTO procedure must establish only one LOTO Safe Zone, where all energy isolations are performed. Multiple scenarios may only be addressed by creating separate LOTO procedures. Multiple scopes of work may be performed under the same LOTO procedure, provided that each scope is described on the LOTO procedure and that the LOTO Safe Zone is adequate. Normal LOTO Lock removal takes place following Work Process D, Work Process E, Work Process F, or Work Process G. This work process describes LOTO lock removal under special conditions, such as lost keys or unavailable personnel. Any LOTO Authorized Person may remove his or her own personal LOTO lock. In the event the key to a lock is lost or misplaced, the lock may be cut by the LOTO Authorized Person after obtaining verbal permission from the Person In Charge of the LOTO. In the event that a LOTO Authorized Person is absent, or otherwise unavailable to remove his or her personal LOTO lock(s), the Responsible Individual (RI) may remove the LOTO lock(s) for the Authorized Person, subject to the restrictions in this section. If a Responsible Individual has not been assigned, then either the absent Authorized Person’s supervisor or the EHS Electrical Safety Program Manager (or his/her designee) may perform the task. Obtain a printed copy of the Absent Authorized Person LOTO Lock Removal Form. Verify that the absent Authorized Person who applied his or her personal lock(s) is not present at the site. Make all reasonable efforts to inform the absent Authorized Person that his/her lockout or tagout device needs to be removed. Make all reasonable efforts to inform the absent Authorized Person’s supervisor that his/her employee’s lockout or tagout device needs to be removed. For subcontractors, additional requirements may exist in the subcontractor’s LOTO program. The subcontractor’s LOTO program is on file with the EHS Electrical Safety Group. The EHS Electrical Safety Program Manager or his/her designee must consult the subcontractor’s LOTO program and follow any guidance therein prior to granting approval. After obtaining all required approvals, the RI (or EHS Electrical Safety Program Manager designee if necessary) must remove the lock(s). If present, the Absent Person’s supervisor must physically witness the lock removal and must retain possession of the lock(s). Before the Absent Person returns to any work duty, the Absent Person’s supervisor must ensure that the person is presented with the removed lock and is informed of the reasons for the removal. The completed absent Authorized Person LOTO Lock Removal Form must be returned to the EHS Electrical Safety Group for record keeping. In the event the key to an RI Lock is lost or misplaced, the RI may cut their own RI Lock. Follow all the requirements for removing an Absent Person’s Personal LOTO Lock. A new RI must be assigned and the LOTO must be transferred to the new RI. The new RI must ensure that all aspects of the LOTO are properly managed. Assistance may be required from a LOTO Coordinator or from the EHS Electrical Safety Group. Group LOTO lock removal requires extreme caution. Since the key to a group LOTO lock is normally kept in a locked lockbox, a missing key suggests several alternatives. The lock could in fact belong to a separate Group LOTO with its key in a separate lockbox. Therefore, all due diligence is required to ensure that a separate active Group LOTO is not unknowingly defeated by cutting a group LOTO lock. Assistance from a LOTO Coordinator or from the LBNL Electrical Safety Group is recommended. A LOTO procedure inspection consists of an evaluator observing the performance of a LOTO procedure by a LOTO Authorized Person and completing an inspection checklist on an EHS database. The evaluator must be trained as a LOTO Responsible Individual. However, the evaluator must not be a participant in the LOTO procedure being evaluated, either as the Responsible Individual or a LOTO Authorized Person. All LOTO procedures at Berkeley Lab are subject to annual inspection. The EHS Division will coordinate the Laboratory-wide LOTO Procedure Inspection Program and certify that the inspections have been completed. To meet this requirement, each division is responsible for conducting inspections of its LOTO procedures and submitting the results to the Electrical Safety Group for record keeping. A grouping of individual LOTO procedures meeting these criteria would be considered one procedure for periodic inspection purposes. Air gapping is the process whereby the sources of hazardous energy are physically removed from the work area to such an extent that Lockout/Tagout is not feasible and not necessary. It is a natural step during either the new construction or the demolition phases of a project. It is also applicable when machinery is temporarily relocated from its normal installation area to a separate work area for repair, servicing, or maintenance. Air gapping shall not be used as a substitute for LOTO controls, where LOTO controls are feasible. Where application of a lock is not feasible (such as for the removal of fuses, spool pieces, or other methods), Work Process H, Tagout Only, must be used. All energy sources must be physically and visibly separated from the work area. This separation must be visible without opening any cabinets or manhole covers, etc. The minimum separation distance is five feet. For electrical systems, this includes the conduit, cable tray, or other cable-supporting device. Where a five-feet air gap is not achievable but LOTO is not feasible, additional controls must be implemented to prevent an unplanned reconnection of the energy source. These controls shall be approved by the EHS Electrical Safety Group on a case-by-case basis. Air gapping must be a documented part of the overall job plan. Except for temporary relocation of machinery, quick-disconnects or other temporary disconnections of wiring, piping, or waveguides are not considered suitable for air gapping. Air gapping shall not be used for reconfiguration of cubicle partitions. During new construction, work will proceed through various stages. At some point, energy sources are connected and the LOTO process comes into effect. Until that point, air gapping is sufficient. LOTO is required to perform the initial connection or tie-in to the energy source. After this time, all work performed downstream of the energy source on equipment requires the application of LOTO controls. The transition from work under an air gap to work under LOTO must be managed under a documented energization and/or commissioning plan. For demolition projects, LOTO is required to perform the initial demolition of the energy tie-ins. After initial disconnection, the conduit or piping must be removed at least five feet from the tie-in point, and in a way that cannot be immediately reconnected. After this point in time, the LOTO can be cleared, and LOTO controls are no longer applicable in the work area. The transition from work under LOTO to work under an air gap must be managed under a documented decommissioning plan. For work performed on equipment that has been physically removed from the normal installation area, LOTO is not required. LOTO is required to perform the initial disconnection. LOTO must remain in place to control the energy to the cables, pipes, or waveguides that are still in the area, unless these are made safe through enclosing, insulating, capping, blanking, or other methods suitable for the environment to prevent inadvertent release of energy. Any person performing work in the installation area must be personally locked out depending on their exposure. Prior to reinstalling the equipment, the LOTO must be re-established. The transition from work-under-LOTO to work-not-requiring-LOTO and vice-versa must be documented and managed in the work plan. Interlock systems are designed to automate certain safety functions and prevent injury during normal operation of equipment or some anticipated abnormal conditions. Interlocks consist of one or more devices engineered to detect an undesired condition and shut down the equipment or otherwise remove the immediate hazard. Interlocks are often electrical switches but can be mechanical in nature. Interlocks are often applied to area hazards where the hazard is unlikely to be recognized in time to prevent injury. Interlocks are not a substitute for LOTO controls and shall not be used or otherwise relied upon for the purpose of protecting persons performing servicing or maintenance on equipment. Additionally, an interlock cannot serve as a LOTO energy isolation point since it does not constitute a positive energy isolation. Credited control radiation safety systems are essentially interlock systems designed to protect personnel against radiological hazards. Radiological hazards covered by 10 CFR 835 are exempt from the scope of 10 CFR 851. 10 CFR 835 establishes credited control radiation safety systems designed for some of the radiological hazards at Berkeley Lab. They provide interlocked access controls to ionizing radiation area enclosures without requiring the LOTO of the radiation generating device (RGD). This exception applies only to the area protected by the credited control radiation safety system. This exception applies only to the radiological (ionizing radiation) hazard and not to other types of hazardous energy (e.g., high voltage, radio-frequency radiation, lasers, or cryogens) within the protected area, even though they may also be interlocked in conjunction with the RGD. Specific definitions and requirements for RGDs, radiation safety systems, and credited controls are found in the ES&H Manual Radiation Safety program, EH&S Procedure 730 (Radiation Generating Device Program), and EH&S Procedure 731 (RGD Interlock Program). A trapped key interlock system is an area access control system where a key is held captive until a certain condition is satisfied. Common types of trapped key interlock systems include Kirk keys and Castell locks, named after the inventors. When the condition is satisfied and the key is released, the key is carried to unlock another enclosure or set of keys. The key is again held captive in the new enclosure while the enclosure is unlocked. The trapped key interlock system is permanently installed on the equipment. Trapped key interlocks serve the primary purpose of enforcing a specific sequence. At Berkeley Lab, they are usually found in accelerator applications to prevent unauthorized access to hazardous areas. They are also commonly found in high-voltage applications, also to prevent unauthorized access. Limiting the number of LOTO Authorized Persons to the number of token keys available. Each person accessing the controlled area must keep the token key on their person while in the area. Place at least one token key in a lockbox, then use the group LOTO procedure. A properly designed trapped key interlock system can significantly strengthen a LOTO procedure by making it physically impossible to violate key steps in the required sequence. Trapped key interlock systems where the last key is held captive in a lock do not meet the requirement for LOTO but can still be used to enforce the required sequence. In this case the LOTO process simply overlaps the trapped key interlock system. Trapped key interlock systems do not eliminate the need to follow all steps in the LOTO process, including the need for written LOTO procedures and verifying the absence of energy. Bypassing or defeating a trapped key interlock is expressly forbidden. A careful distinction must be made between LOTO controls and various other locking practices, collectively referred to as “administrative locking.” While LOTO locks are placed by individual workers to protect themselves against inadvertent energization of equipment, administrative locks are used when there is the need to provide “operational control” (control of a system, utility, or facility). Any lock that is used for a purpose other than LOTO is called an administrative lock. Administrative locks may serve a safety function other than LOTO, a configuration-control function, or any other purpose. Unlike LOTO lock keys, the keys to administrative locks may be controlled by one or more individuals. Administrative locks can be common locks with more than one key, so that anyone with access to the keys can open the control point as needed. The lock is not specific to an individual, but to a specialized working group or trade. Administrative tags, likewise, are also common to multiple people and do not need to have an individual’s name shown. Administrative locking does not provide individual personal protection for workers and is not a substitute for personal LOTO. An administrative lock shall not be red and shall not be labeled with a danger tag or sticker, or any other marking that resembles a LOTO marking. Conversely, a LOTO lock cannot be used as an administrative lock. Administrative locking may be used in conjunction with LOTO locks and using the same LOTO devices. For example, a controlling department may apply an administrative lock to a LOTO for the purpose of controlling the start-up of the equipment. Persons who have applied administrative locks shall not perform work or enter a hazardous zone without first applying personal LOTO locks. Administrative locks may not be cut unless communication has been made with either the person who applied the lock or with someone in the controlling department. Some systems, such as sump pumps, emergency lights, and refrigerators, must be shut down in a controlled manner. An informational tag may be placed on their isolations to warn the user against accidental de-energization. The use of a LOTO tag is not permitted for this purpose. When a circuit breaker, disconnect switch, or energy-securing device is readily accessible to any employee, the circuit breaker or disconnect switch may be tagged to indicate that it is not to be turned off. The energy-securing device must not be locked by any means that would prevent the device from being used as an emergency disconnect. The tag must include the name of the responsible person and an alternate, date, and phone number. Some large projects or events require the coordination of multiple LOTO procedures. These events include major maintenance outages, emergency outages, initial building energization, or other large projects. The increased complexity may require the assignment of an overall LOTO Coordinator to ensure that conflicts in schedule, outage planning, and required energized events do not lead to confusion. The assignment of a LOTO Coordinator is a line-management decision. The LOTO Coordinator must be a designated LOTO Approver assigned by line management for a specific project, outage, or time period. The LOTO Coordinator must maintain overall control of the LOTOs established during the time period covered by the event. The LOTO Coordinator must participate in project planning and periodic update meetings to ensure that all scheduling conflicts affecting the LOTOs are resolved satisfactorily. The LOTO Coordinator is not assigned the duties of Responsible Individual for the LOTOs. The LOTO Coordinator must instead ensure the various Responsible Individuals are properly informed of any changes that will affect their respective LOTO procedures. This can include a change in shutdown or start-up times, an unexpected temporary restoration of power, or a change in the scope of work. Conversely, all Responsible Individuals must keep the LOTO Coordinator informed of changes that may affect the overall project schedule. The LOTO Coordinator is considered a LOTO Affected Person for all LOTOs on the project and therefore must be notified as required in Work Process D, Work Process E, and Work Process F.
This card is intended as a memory aid for the LOTO Authorized Person performing a simple LOTO. Specific requirements, cautions, and instructions can be found in Work Process D. Contact EHS to obtain a card. These are also distributed in class. Administrative Information. This includes information such as approval dates, locations, project name, persons involved, and other tracking information. Scope of Work. This must clearly describe the scope of work covered by the LOTO procedure. The scope statement should be detailed and accurate enough to match the list of isolations in the isolation checklist. The target reader for the scope statement is the LOTO Authorized Person who is consulting the LOTO procedure to determine whether his/her task falls within the scope of work allowed by the procedure. This is a description of the load that names or otherwise designates in English the exact item being isolated. This is the number or designator found on the energy isolation itself. Breakers are typically identified by their location in an electrical panel. Valves often have metal tags with a stamped alphanumeric designator. Energy Type and Magnitude. This is a descriptive classification of the type of energy. For electrical sources, this is typically voltage, voltage type (AC/DC), and arc flash energy data. Isolation Position. This is typically “LOCKED OPEN,” “LOCKED CLOSED,” “TAGGED OPEN,” and “TAGGED CLOSED.” Other descriptors can be used for special circumstances. Initial Boxes for the Person In Charge. The Person In Charge initials these boxes to establish and clear each energy isolation. Initial boxes for the Person In Charge to establish and clear each dissipation device. LOTO Sequence. Where a specific sequence is required to establish the LOTO, a step-by-step shutdown, switching, and/or valving checklist must be added to the LOTO procedure. Lockout/Tagout (LOTO) is therefore composed of two principal process components: de-energization and control. De-energization removes all energy sources from the system, while control prevents re-energization. De-energization is the process of removing all energy from a system and achieving a zero-energy state. It includes three subcomponents: isolation, dissipation, and verification. Isolation is simply the process of disconnecting or blocking all sources of energy that normally power the system. This can include opening a breaker or shutting a valve. Equipment with multiple sources of energy must have all its sources identified and isolated. Dissipation is the process of releasing any remaining stored energy once the primary sources have been isolated. This can include discharging a capacitor bank, depressurizing a hydraulic accumulator, or passivating a chemical tank. Where a system is capable of re-accumulating stored energy even after the initial dissipation, then a method must be employed to continuously discharge stored energy. Verification is the process of ensuring, through testing, measuring, or another suitable method, that the energy isolations and the dissipation of stored energy have been effective. This can include a voltage measurement, a pressure test, or a visual verification of immobility. Proving a negative presents special challenges, so in all cases a functional test of the instrument is required both before and after testing the system for absence of energy. A LOTO procedure is a formal document that details the required isolations, stored-energy dissipation methods, all steps required to achieve a zero-energy state, and the scope of work allowed under the lockout. Building a suitable LOTO procedure (Work Process N) is an essential prerequisite. It begins with a detailed hazard analysis. Unidentified hazards can result in a system that has not been placed in a zero-energy state and can have fatal consequences. For the most basic LOTO condition, called the simple LOTO, a LOTO procedure is not required. For all other LOTOs, the complex or group LOTO methods must be employed, and both require a LOTO procedure. All lockouts have an assigned Person In Charge who is accountable for the safe execution of the lockout. All LOTO Authorized Persons locking onto the LOTO must understand the extent of the LOTO Safe Zone. The Person In Charge is accountable for sufficiently communicating the LOTO Safe Zone. 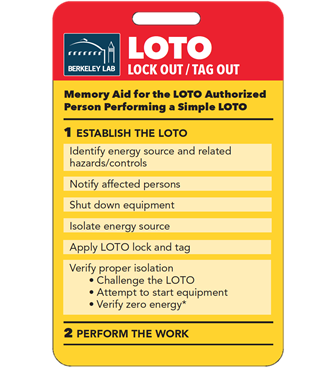 One fundamental requirement of the Berkeley Lab LOTO Program is that every person performing work under a LOTO must be personally locked out. Furthermore, no person is ever authorized to apply someone else’s personal LOTO lock or tag. Except under the restrictions of Work Process O, no person is ever authorized to remove someone else’s personal LOTO lock or tag. While some lockout methods can include a variety of tools such as lockboxes, it remains that no isolation can be removed without first having every single person remove his/her personal locks. Any system or combination of lockout devices must meet this basic requirement. Although LOTO devices are designed with a minimum physical strength, it is still possible to defeat them with excessive force or tools. Additionally, in the event that a LOTO device was improperly applied, the device may not perform its intended function, which is to prevent actuation of the energy isolation. For this reason, LOTO hardware components are designed with very distinctive markings and colors, which are described in Work Process L. These clearly identify the components as LOTO-related so that persons with very limited knowledge of the process will understand that they are not to tamper with LOTO components. 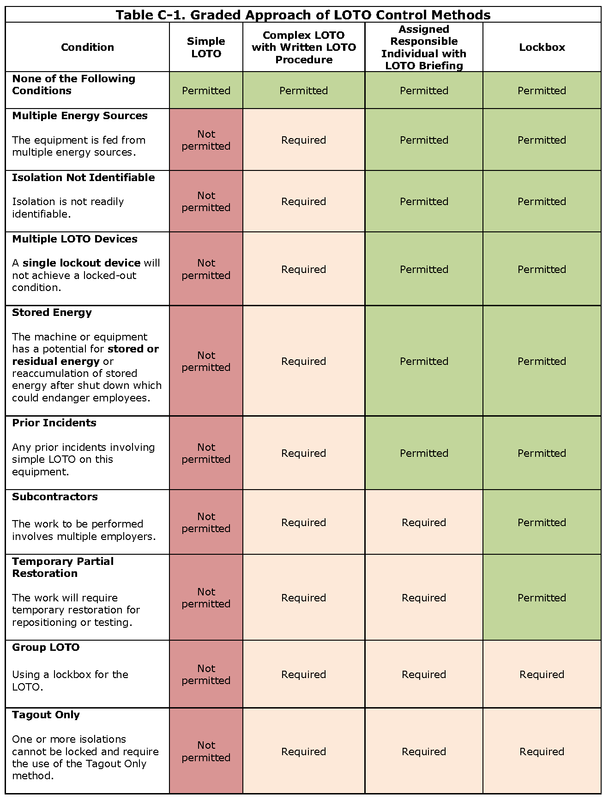 The Berkeley Lab LOTO Program employs a graded approach to controlling hazardous energy. The processes described in this document are layered to provide increasing levels of controls to match increasing levels of hazards. The graded approach is reflected both in the different levels of training as well as the different levels of documentation, planning, approval, and supervision to execute a LOTO. Table C-1 shows how the various controls are matched to the hazards.